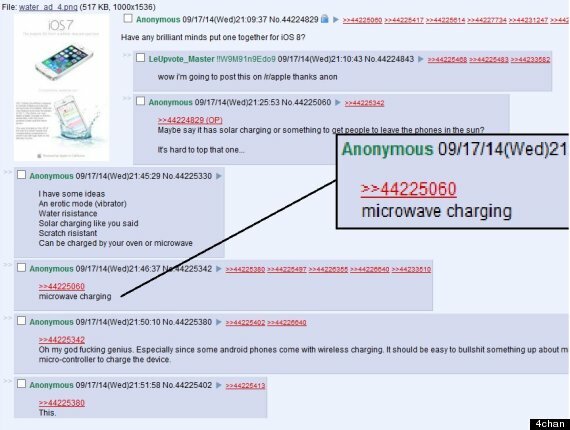 There's a hoax going around the Internet instructing people to put their iPhone in a microwave in order to charge it. Let us be very clear here: Do. Not. Put. Your. Phone. In. A. Microwave. On Wednesday, anyone with an iPhone purchased in the past three years could download iOS 8, Apple's shiny new operating system. iOS 8 has many fun new features, including snappier email, smarter autocorrect and a fitness tracker. But an image circulating on Twitter describes one fun, "exclusive" feature that's definitely not included in iOS 8. 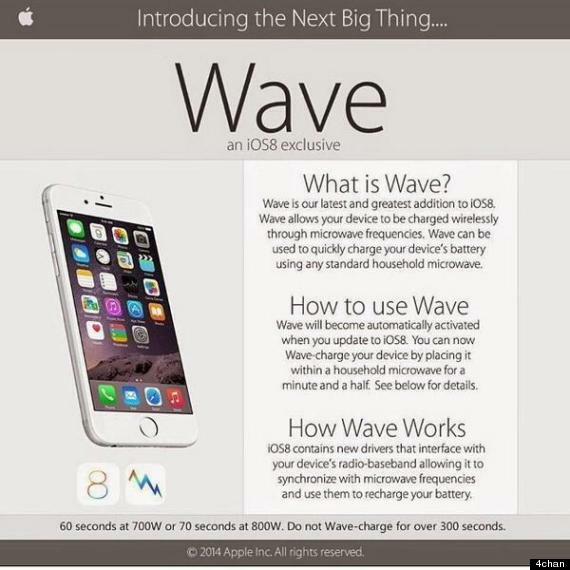 It claims that you can wirelessly charge an iPhone by putting it in the microwave for 60 to 70 seconds. Despite the sleek Apple-esque design of the explainer for the "feature," there are a couple telltale signs that this image is fake. One, there's no "i" in front of "Wave." Duh. Two, on what Earth would it be a good idea to put a hunk of metal in a microwave? Like most awful things on the Internet, it seems like this hoax may have originated on 4chan, according to screengrabs posted on Reddit. ...before clarifying that his tweet was, basically, a hoax within a hoax. Let's hope no one actually tried.